Throughout President Obama’s tour of Alaska last week, he spoke at length about efforts to reduce the nation’s greenhouse gas emissions. He spoke very little about his support for Arctic Ocean drilling. In Kotzebue, Obama spoke of climate-friendly initiatives big and small around the state. 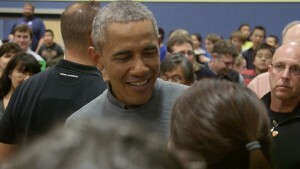 “And I know you guys have started putting up solar panels and wind turbines around Kotzebue,” President Obama said. “Last month, I announced the first set of nationwide standards to end the limitless carbon emissions from our power plants, and that’s the most important step we’ve ever taken on climate change,” President Obama said. Alaska is exempt from that plan. The president did not mention one of his policies that does have direct relevance in Kotzebue and the rest of Alaska. Kotzebue is one of the Western Alaska port towns getting business from the quest for oil in the Chukchi Sea. Shell’s Arctic Challenger oil-spill barge and other support vessels are based in Kotzebue Sound. The Obama administration gave Shell the green light in August to drill into oil-bearing rocks beneath the Chukchi Sea. The U.S. Geological Survey says more than 20 billion barrels of oil can be recovered from beneath the Chukchi and Beaufort seas. If that oil is burned in engines and homes and businesses, it would pump many times more carbon dioxide into the sky than the president’s big clean power plan would keep out of the sky. “Approximately 15-times greater,” Lois Epstein, an engineer with The Wilderness Society in Anchorage, said. Her group has been opposed to drilling in the Arctic Ocean for mostly non-climate reasons. She says Obama’s approval of Arctic drilling is inconsistent with his big push to fight climate change. “I think to just say we can do without hydrocarbons, and we don’t need them any more, stop exploring for them because they are coming out of our ears already—that is not quite an accurate reflection for a company like us,” Van Beurden said. Van Beurden put responsibility for opening the Arctic Ocean to drilling on the U.S. government. Shell officials say it could be 10 to 20 years before any oil from the Chukchi Sea would be available as fuel. That would mean Arctic drilling could remain controversial for a long time.